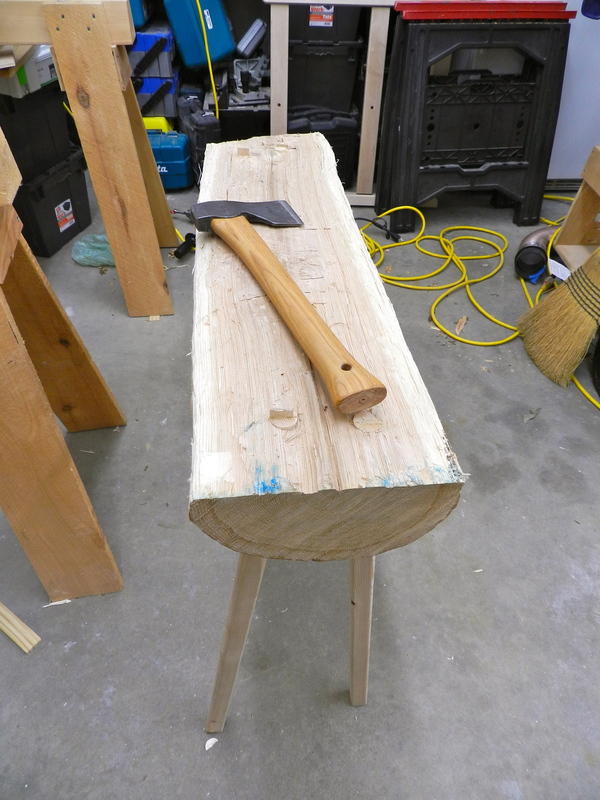 After living with my new hewing bench for a few weeks I finally got around to using the other half of the log. I’m glad things worked out this way as I made some modest improvements based on our time together. 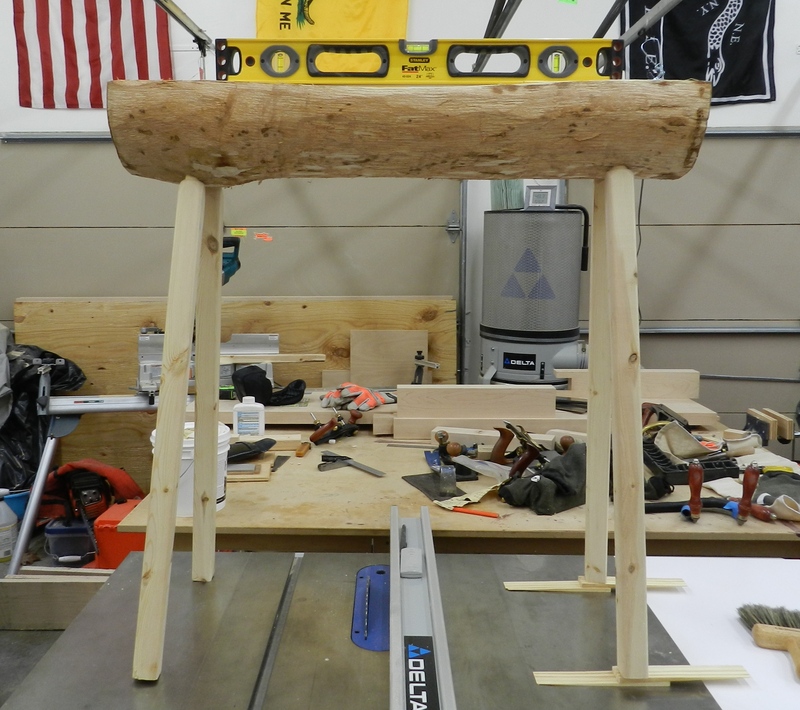 The original bench was fairly solid — it could hold me standing on it and didn’t bounce around when I would strike it in a downward motion — but when I’d do something heavy and lateral I could feel what felt like a tiny bit of flex in the the legs. 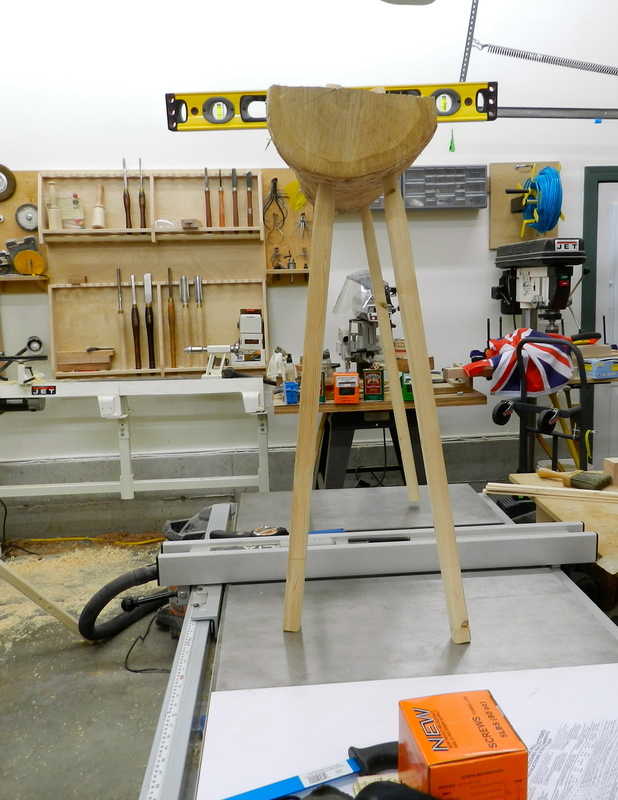 At the time I ripped down a 2×3 to make the legs roughly sized to the 1″ ship auger bit which was the largest I had on hand, but I worried about the 1-1/8″ legs being too spindly. The mental image of the legs being too spindly haunted me, so for this second time out I decided to rectify that issue. 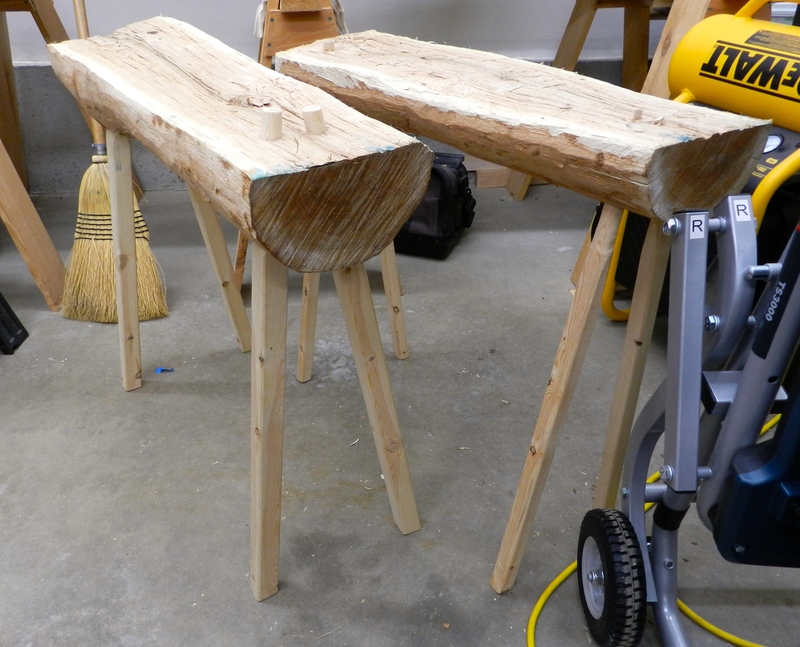 Completed benches. They can also work well as a pair of saw horses. The new bench is rock solid and will be a workhorse in the shop. The new legs are nice and stiff. 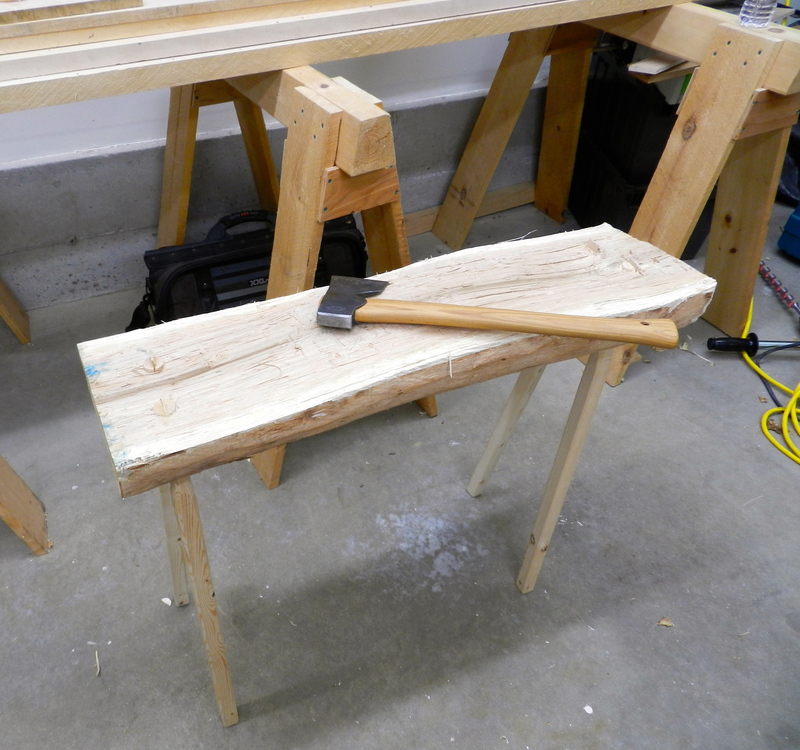 Having a pair of these benches in the shop has already come in handy as you’ll see in the next post. If you’ve watched Roy Underhill on the Woodwright’s Shop with any regularity then no doubt you’ve seen him using a hewing bench. 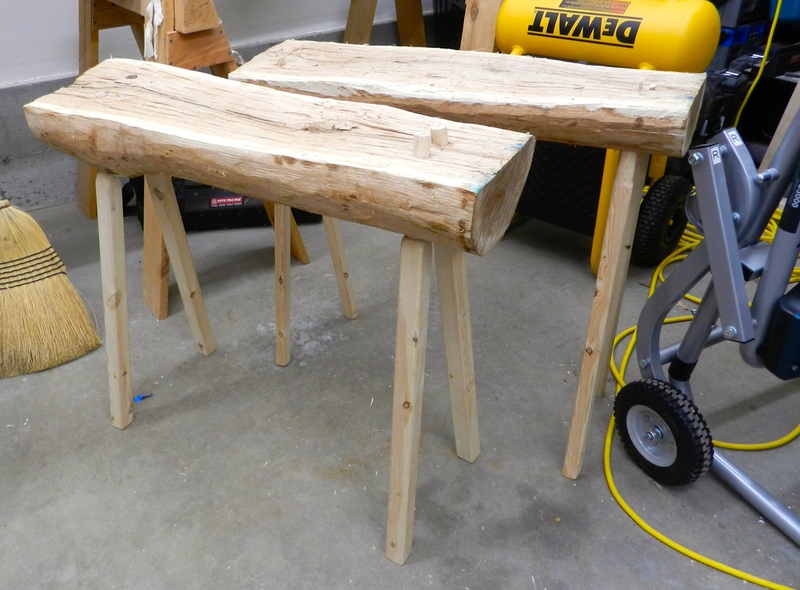 It’s a great little bench made from half a log on 4 modest legs. Roy’s used it for hewing, trimming, holding, sitting and many other common shop uses. It’s a project you can complete in an afternoon and will serve you well for many years in the shop. Why would anyone really want this rough little bench? How do I make one of these benches? 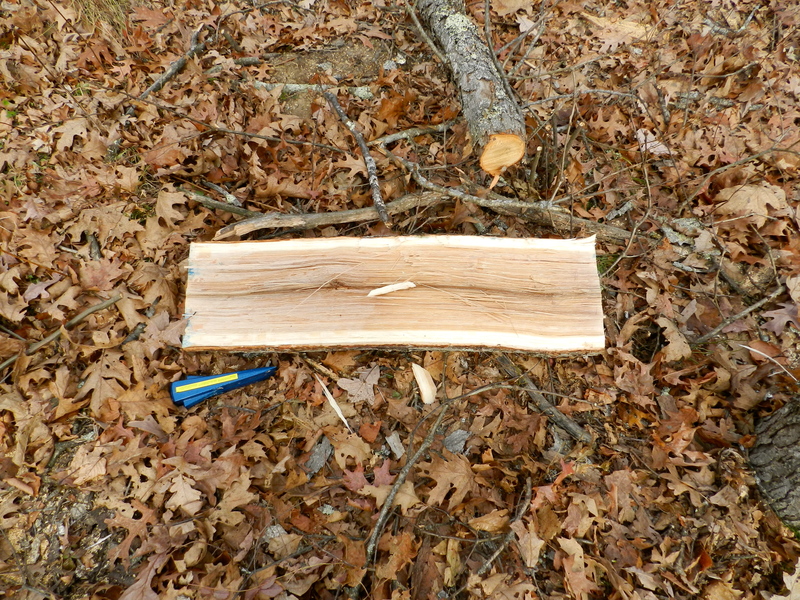 In this case I took a 12-15″ wide and 30″ long section of white oak from a large tree I recently felled in my yard. This tree was over 130 years old so the growth rings are nice and tight. 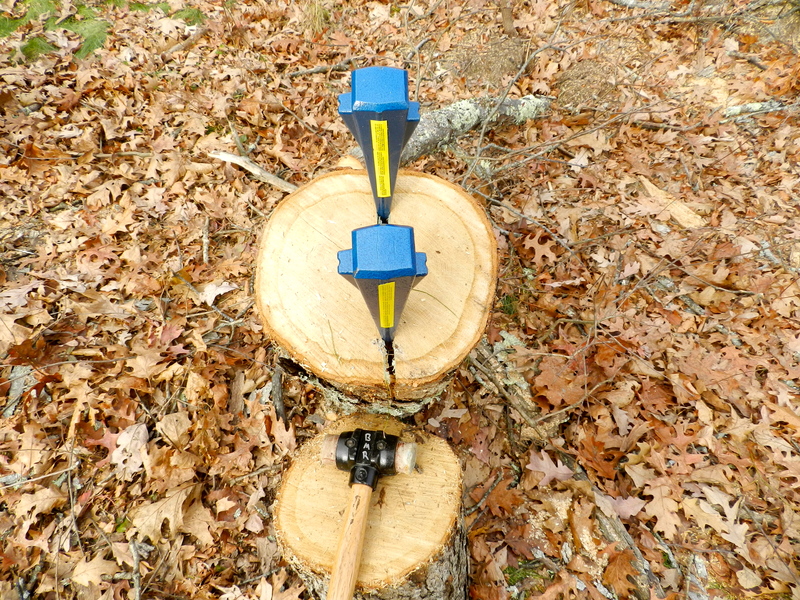 Using metal wedges and a large leather faced mallet I use for my timber framing I split the log in half. 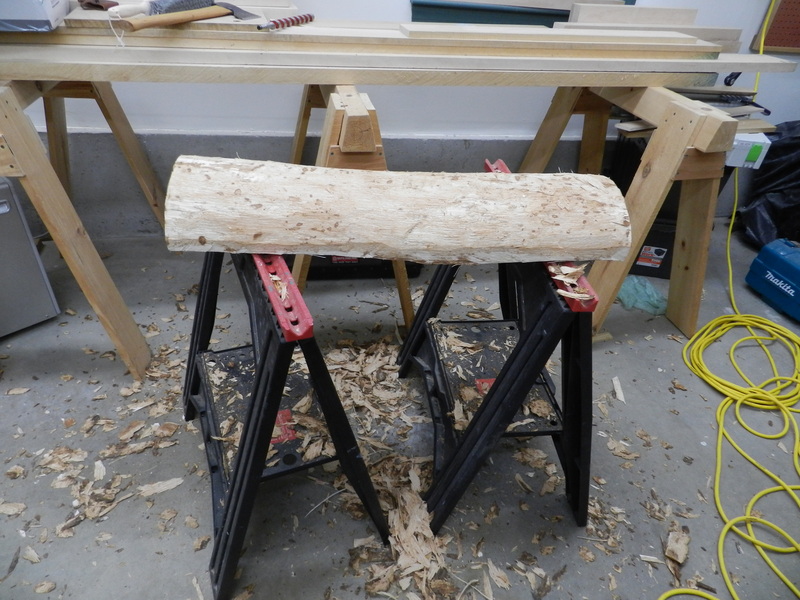 If the wedges alone cannot do the whole job of splitting for you, a froe can help it along. After letting the slabs sit for a few days, it was time to de-bark the logs. If you don’t have a dedicated de-barking spud you can use any tough metal roughly chisel shaped tool or ax. In this case I used a 16lb post hold digger as shown below. De-barking the log on the right. A metal post hole digging bar makes a good impromptu barking spud. Back again in the shop I squared up the edges of the log with a hatchet. Being a green piece of wood this razor sharp ax made quick work of it. I flipped the log over and removed any remaining bark. Ideally you want to split out some 1.5 inch diameter legs. In my case it was snowing and I didn’t have suitable wood on hand to do that, plus the largest ship auger bit I had on hand was 1″. I ripped down some nice straight grained 2x3s I had on hand to 1 1/4″ by 30″ long. I put them on the lathe and turned down the top 6″ to 1″ diameter. I then used a block plane to chamfer the edges. Using a ship auger bit I bored a through hole into the log to allow the legs to splay a bit in both directions. 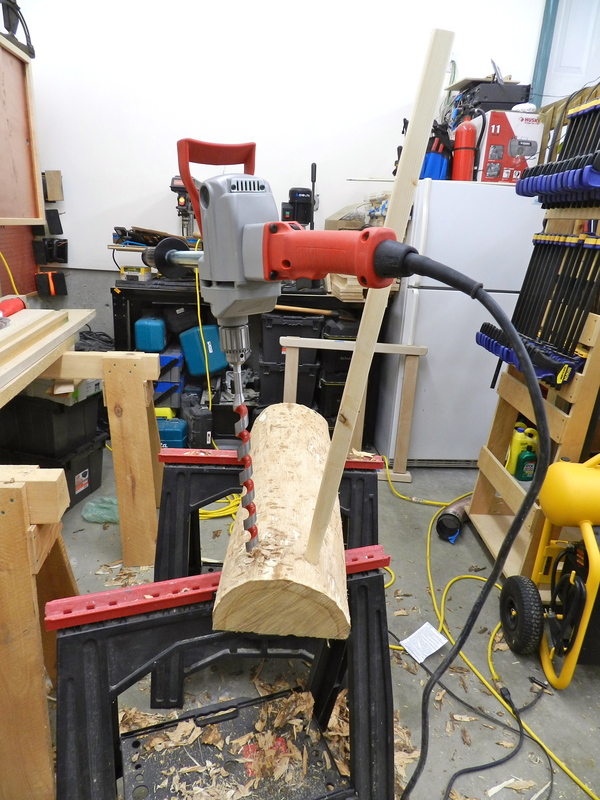 After you set the first leg you’ll want to visually reference that first leg when drilling the next leg. Repeat this process for all 4 legs. 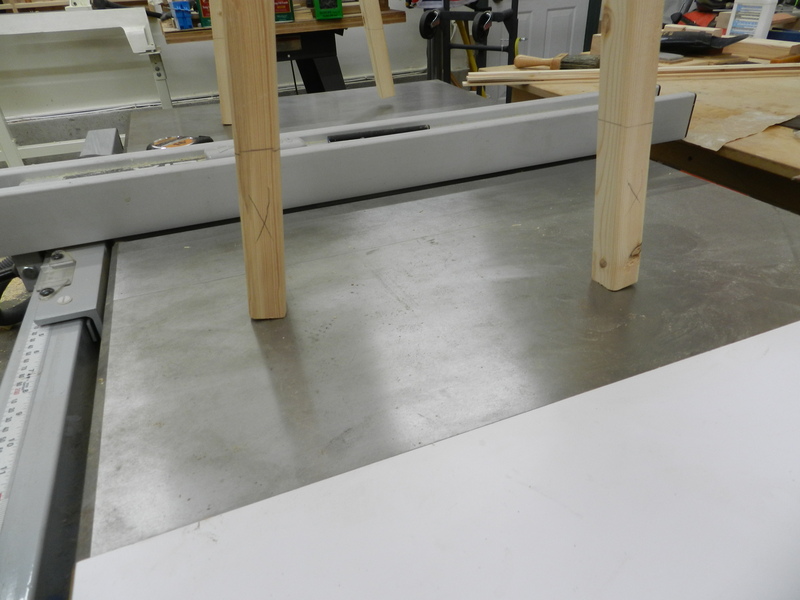 After test fitting you’ll want to cut a kerf in the end of each tenon and re-install the legs. 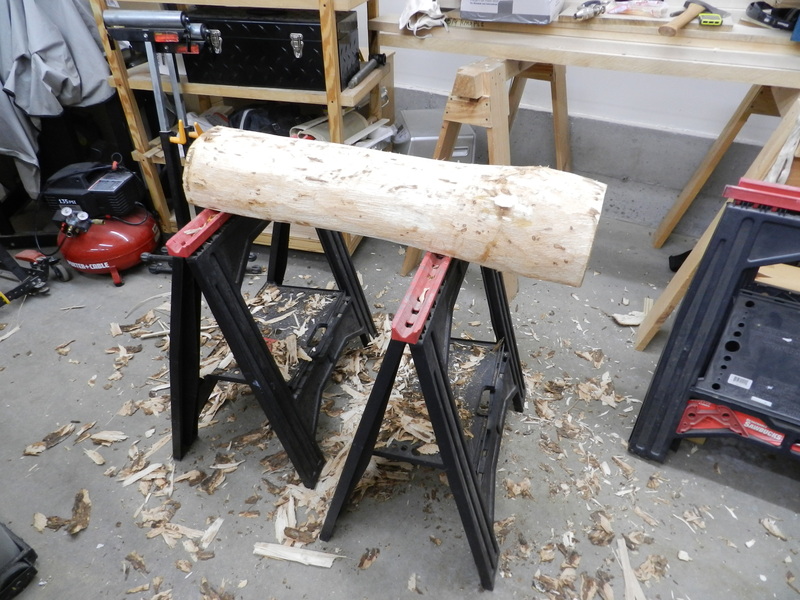 Make sure those kerfs are perpendicular to the grain of the log so you don’t split it with the wedges. Then glue and wedge the tenons. 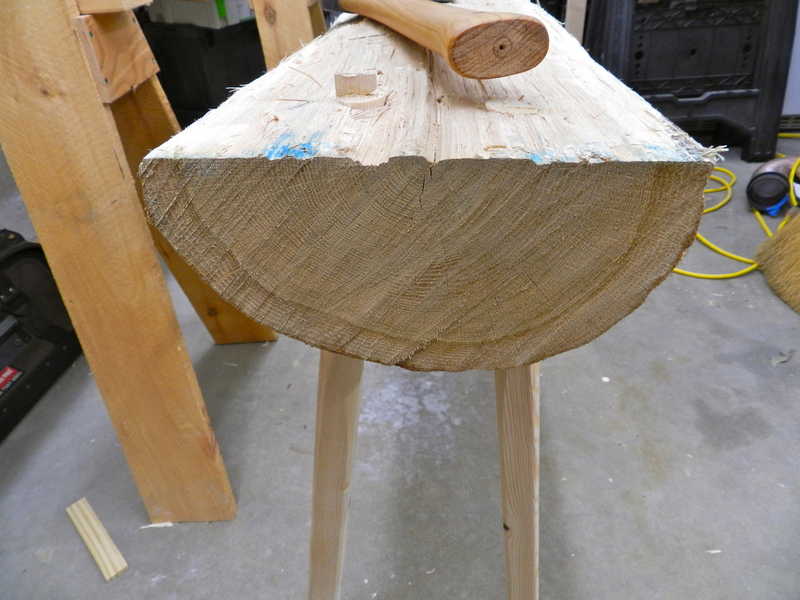 If you have ever built a windsor chair, this is a cruder version of the same process you’d use to fit the legs and level the feet. With the legs installed I put the bench on a known level surface, in this case my table saw. Using a compass or similar tool mark higher up on the legs and cut them where you marked them. Then chamfer the ends of the feet and you’re almost done. Next I applied some end grain sealer (from Land Ark/Heritage Finishes) to reduce the likelihood of splitting in my heated shop. I also trimmed off the wedges and tenons. Now the bench is read for use in the shop. This bench, with it’s delicate looking legs, can hold me standing on it, so it should have no problem handling my in shop hewing needs. Shown here is a Gransfors Bruks hand made Swedish ax. This carpenter’s hatchet is my goto ax for small trimming work and is sharpened to the point of being able to shave with it. The poll (the other business end) of this ax is hardened and can be used like a hammer. The handle is carefully tapered to fit in the hand and without looking you know when your hand is at the end of the handle. 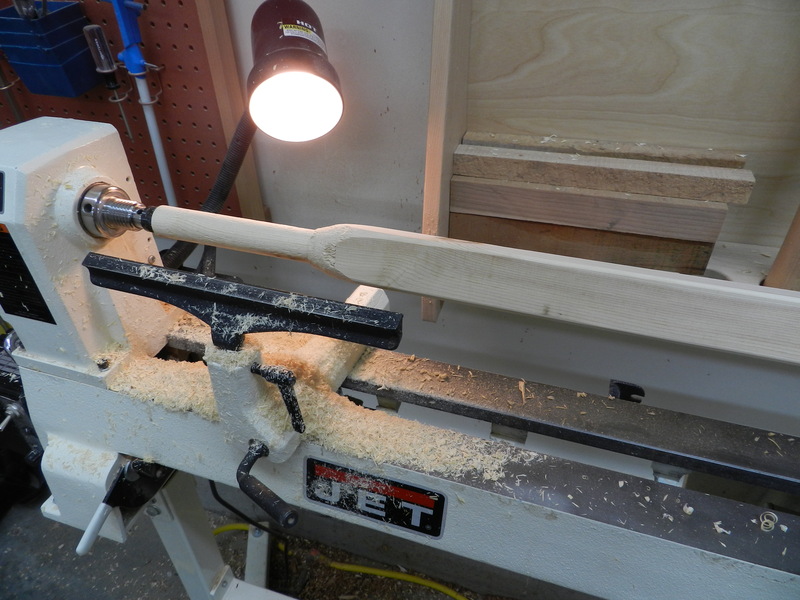 The notch under the bit allows you to use this ax much like a large chisel or plane and can yield impressive results. I used this to quickly level bits of the bench surface. For short cash, a few tools and an afternoon in the shop this project is well worth the effort. I live on a heavily wooded street in New Hampshire that is lined with stone walls. As I pass them each day I think about what it took to clear all this land and build those walls. While most of the neighborhood is covered with second and third growth trees that were not actively managed, and new housing developments, there are still a few pockets of small family farms with cleared farmland that looks like an idealistic painting of yesteryear and reminds us how this was all farmland about 100 years ago. As the leaves changed this season I found it amusing to see tourists snapping pictures in front of some of these farms with their stone walls and weathered barns. In the book referenced above Sloane encouraged his readers to keep an eye out for early barns also made several interesting observations about stone walls. They were designed to keep animals in and not to keep humans out. When a wall fell over you had all the stones needed to rebuild it as opposed to a wooden fence that could have rotted away. I like the sense of inviting simplicity, using what you had on hand and building for the long term. I recently set out to clear some trees out of my backyard and make room for a 12’x24′ timber framed shed/small barn to store extra wood and yard equipment. I’ve cleared about 35 trees so far, knocked off a bucket list item — taking down a full size tree with a felling axe, and still have a few more to go. 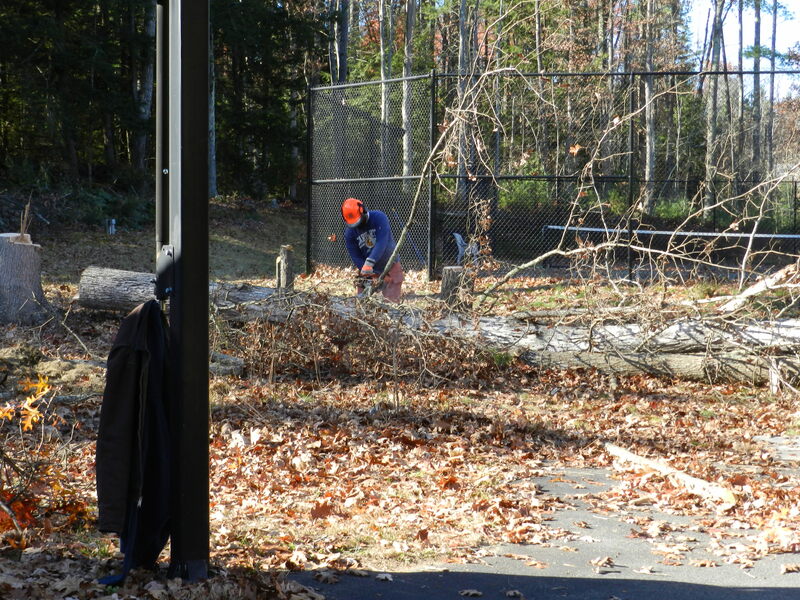 When working with large trees and high powered saw, make sure to ALWAYS wear the appropriate safety gear. Above you can see me wearing my steel toe boots, Kevlar chaps, eye protection, helmet with hearing protection and face shield and Kevlar reinforced gloves. The chaps are like wearing an insulating blanket and rough to wear in the summer, but in cooler months they help you stay warm. How do I cut down a larger tree? I start by walking around the tree from all sides, sighting up at it to see what way it leans and were the mass is held by the limbs. I then mentally think about what direction I have enough space to drop to the tree without hitting houses, other trees, people or fences. With a plan in place I set about felling the tree. The process is much the same whether I use an axe or a chainsaw. I cut in at an angle on the side of the tree facing the way I want it to fall. 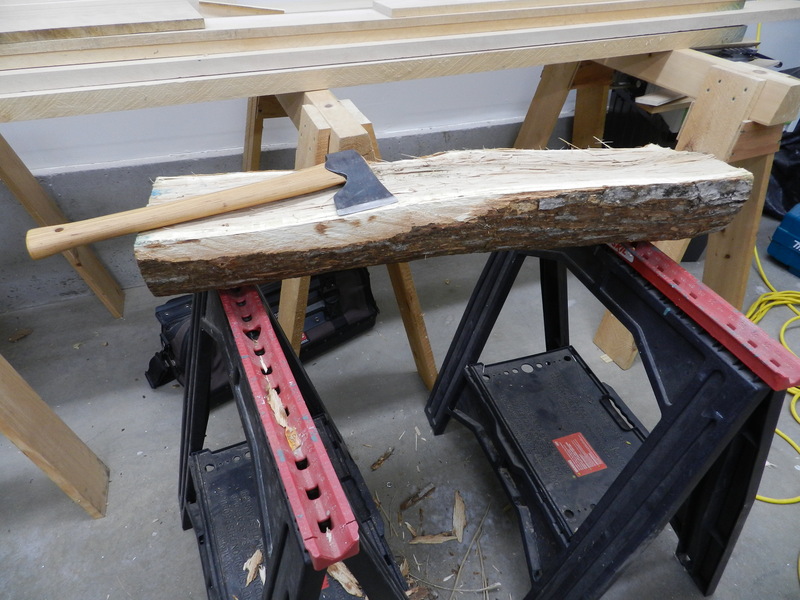 I then make a horizontal cut to remove that wedge of wood. 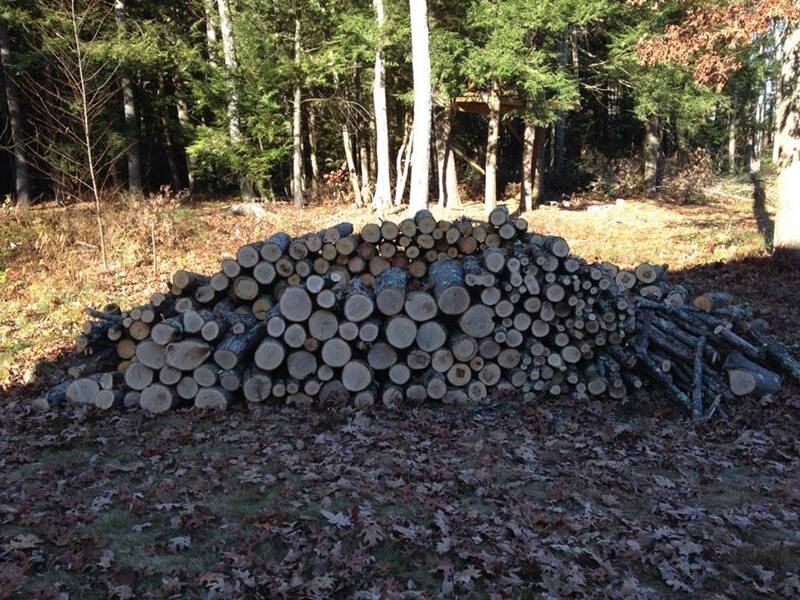 It should only be about 1/3 of the way through the tree. You want the intersection of those two cuts to land right on each other so you have a smooth hinging surface and a controlled drop. I then come from behind the tree and make a horizontal cut until I leave about a 1.5″” wide hinge of wood that will help control the fall. This cut should be about 2″ above the bottom of the wedge cut (As seen in the photo below). If done properly the tree should slowly start to fall over exactly where you want it. The tree shown here was a 90 foot tall oak, so when it hit the ground it shook the ground with an incredible thud — anything in it’s path will get crushed. 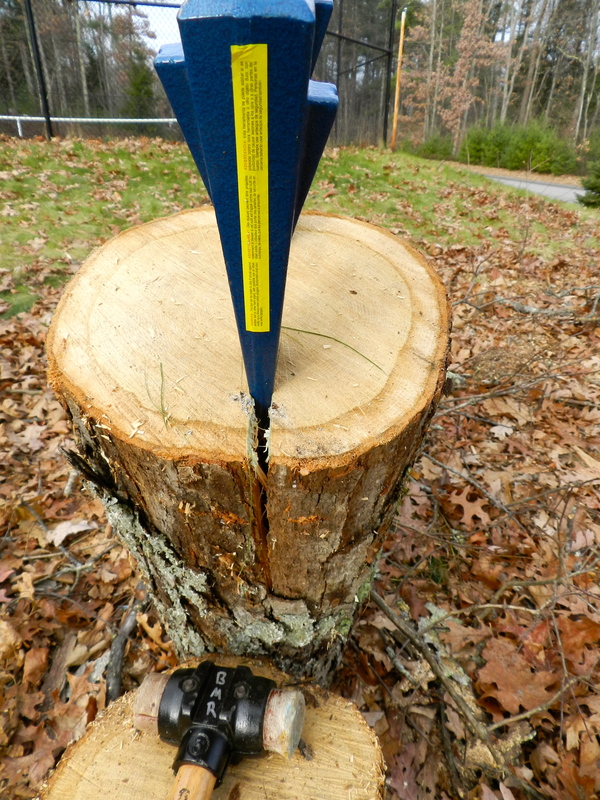 When cutting a tree like this make sure you have a clear retreat path, usually 45 degree from the way you expected the tree to fall, that way you are not in the path of a falling or splitting tree or anything it kicks up. Once on the ground I start removing all the limbs from the tree. 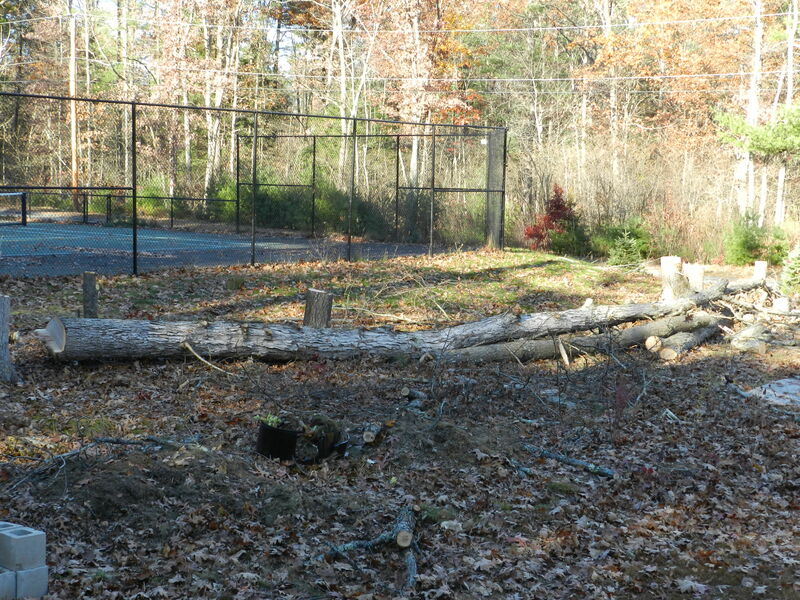 I start with all the limbs that are not holding the trunk up off the ground to make room to better access the trunk. 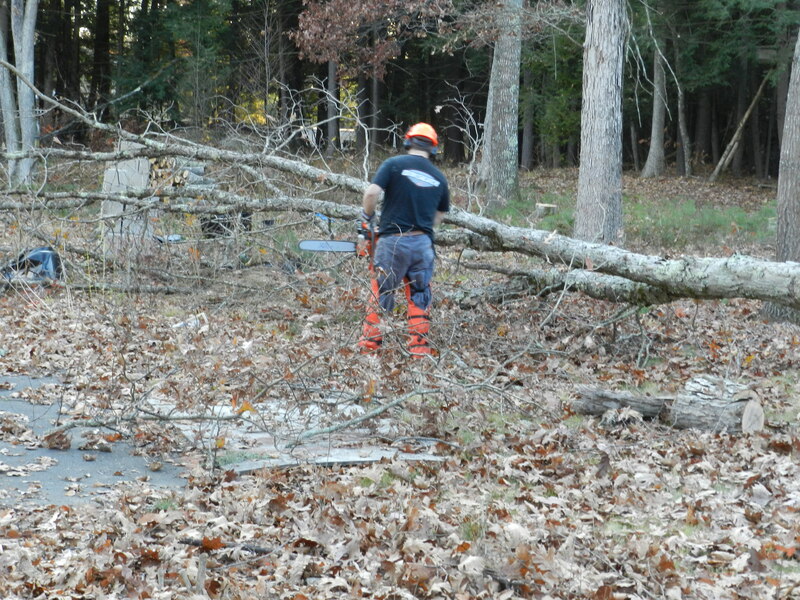 Any limbs or branches that are holding up the trunk are likely going to bind on your chainsaw if you are not careful. 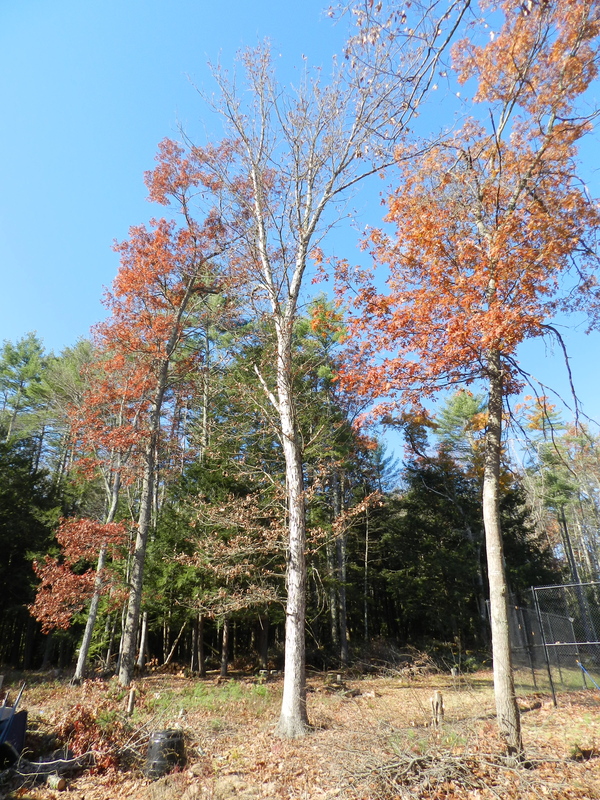 Being mindful of where the tree may move as you release that tension you can use a sharp axe to remove these limbs or careful wedge cuts that will not bind the saw. When doing this sort of work you need to be thinking about where the trunk is likely to fall after removing this limb, so you’ll want to mind your legs and feet. 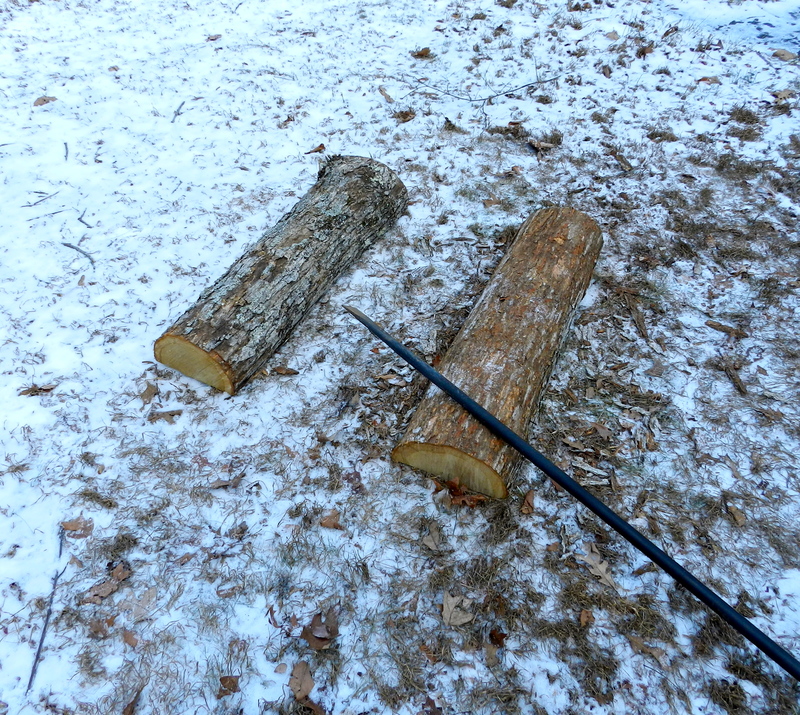 Once the limbs are removed I break the tree trunk down into either firewood or whatever I am looking to use the wood for. These trees will be processed down into several projects — a few bowl blanks, a new base for my anvil, a few chopping benches for the shop, a stump to split firewood on and of course firewood. 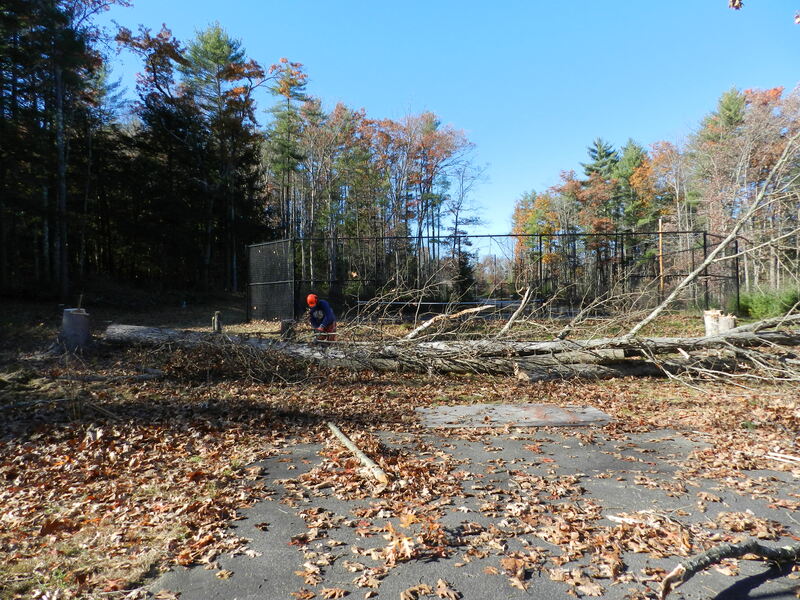 The incredible amount of brush and branches will be ground up into chips and distributed elsewhere on the property. 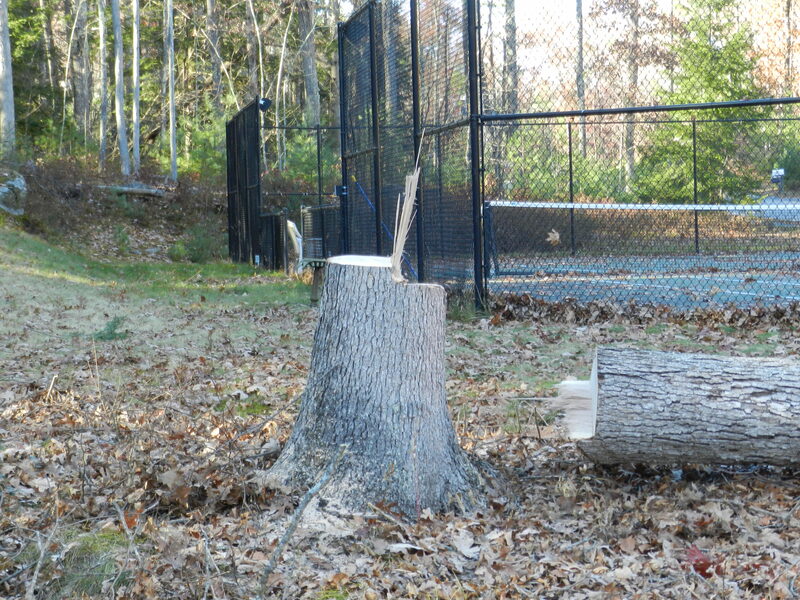 Use plastic or even larger metal wedges to help a cut tree (notched and ready to hinge) that is not falling. You can use a large mallet or beetle to drive in a wedge and help give it that little push it needs to start going over. Even with all of the above information running through my head, and the sometimes backbreaking labor to break down these trees, there was still a lot of time to think. As I was doing the above work I was building the timber framed barn over and over again in my head, so by the time I actually get around to cutting the frame it will be like second nature. Unfortunately the snowy weather is creeping up on me fast, so it will be a race to see if I can get the shed put up this fall/winter or if it will get delayed until spring.